The controversial Independent Electoral and Boundaries Commission (IEBC) CEO Ezra Chiloba could not access his office on Wednesday after he found the office door locks had been changed. According to sorces Mr Chiloba was also informed that the IEBC chairman Wafula Chebukati had travelled with the keys to the new locks abroad. The Employment and Labour Relations Court last week had allowed Mr Chiloba to remain in office as it determines the case he filed against Mr Chebulati and the commission. It is said that Mr Chebukati had suspended the CEO for three months, so as to create room for scrutiny of unspecified “procurement issues” at the commission. 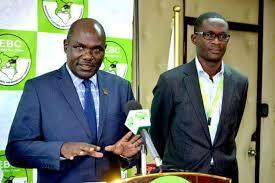 But a statement issued by Mr Chebukati last week said that Mr Chiloba was still suspended from his duties at the commission to allow for the completion of a comprehensive audit on major procurement relating to the August 8 general election. The IEBC leadership has been in a tag of blame games, everyone blaming the other for mistakes and corruction that has been part of the commission since last general election.